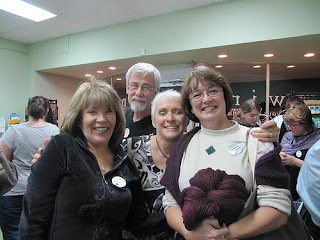 The Spinsters took a road trip Thursday night, all the way down to Burbank, for the second annual Ravelry Party at Unwind. Manos del Uruguay Silk & Wool yarn for Ginny to make me a sweater! 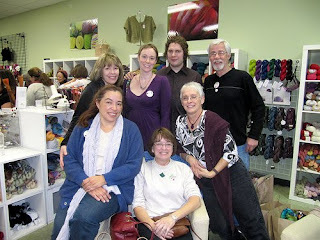 The event was sold out and the shop was packed to the hilt with yarnies, all wanting their pictures taken with the Ravelmeisters, Casey, Jess and Mary-Heather. And who were we to buck the trend? Party-ers got a discount on Manos yarn, among other things, so I broke my self-imposed yarn diet to buy enough to make a knit sweater. Hey, it was on sale; how could I say no?? 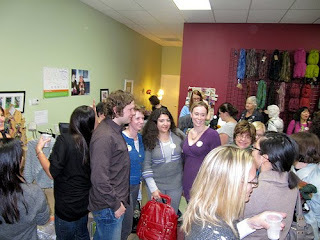 The party lasted until 10 but we called it quits at 9; I'd been on the road since 9:30 that morning, driving to Long Beach for my (wonderful) 'Intentional Patterning' class with Laura Bryant of Prism Yarn and then up to Burbank in rush hour traffic. The patterning class was worth it though - lots of ideas for future projects.